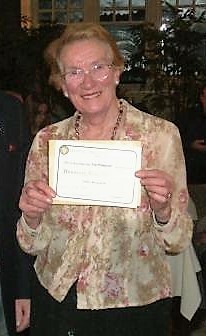 Sotonia founder member and club President, Eva Drinkwater passed away recently aged 94. The following tribute was given by Julian Gee at her funeral. I first met Eva when I joined Sotonia Cycling Club in 1972. I’d been introduced to the club by my Father Ray Gee, who’d recently taken up cycling again after a break of some years and was an old friend of Eva’s husband Frank. By this time, Eva and Frank were stalwarts of Sotonia having been founder members of the club in 1967, when the cycling club they had been members of for many years, the Southern Paragon, decided to pool their resources and help establish a new Southampton based club at a time when the sport and pastime of cycling was in the doldrums. When I joined the club, I recall Eva and Frank were regularly supplying post-race refreshments at most of Sotonia’s events – and along with the tea and cake came a friendly face, Eva was always pleased to see you, and proffering words of encouragement. Up until the time children intervened, Eva had been a very active and successful racing cyclist for the Southern Paragon. Those who knew Eva from the late 1940’s and into the early 1950’s told me she was a regular prize winner in events on both the road – time trials and on the track. Having been told this by my Dad and Eileen Love who raced with Eva, I examined the archives on the Cycling Time Trials South District website, which were quite fascinating, and I discovered in the events from 1947 onward Eva’s name regularly appears at the top end of race results at a time when women’s’ event (no mix races then!) often had over 50 riders. Eva’s club Southern Paragon was one of the top clubs in the South and regularly picked up team prizes, with Eva part of the team, often along with other riders, like Eileen, that Eva had encouraged to take up racing, as she was very encouraging to others, a trait many of you here today will no doubt recognise. Eva was also very active and successful in track racing too, riding regularly at Southampton, Portsmouth and Poole tracks. In the days before cash prizes were given, she was able to kit out houses with prizes of cutlery and glasses which were often given as race prizes at that time. Eva was equally happy to take the lead or support others and make up a team. Eva was very adventurous, and her cycling, racing and other activities took her all over the country but particularly to Wales where she had family connections. It was there amongst other places that she pursued one of her other long-time passions, rambling. Amongst her achievements were climbing Snowdon. In the 50’s and 60s the Drinkwater family were a feature of Paragon camping weekends, sometimes assisted by a chap named Taffy Spinks who owned car to take the camping equipment so Eva and Frank and their clubmates could ride to the destination. Closer to home Eva was a founder member of Romsey Ramblers over 30 years ago, where her extensive knowledge of the local area was very useful and she was also a keen member of Southampton Canal Society, where she was part of the backbone of the organisation, making the teas, winning competitions with her geographic knowledge and sharing her enthusiasm as an occasional speaker at meetings. Another lifelong interest of Eva’s was the Woman’s Institute and Eva was one of the leaders of Bassett WI in Southampton. When Eva’s days of club cycling came to an end, she maintained her links with Sotonia. One of the club’s social highlights for many years was Eva and Frank’s summer BBQ where they threw open their garden to members and their families. I’ve also discovered Eva became something of an activist for cycling rights as part of Southampton Cycling Campaign, writing to the City council to suggest improvements to cycle routes in the City. Back with Sotonia, Eva was elected as a Vice President for her contribution to the club and then in 2011 became the club’s President, an honorary role that Frank had also performed some years early. Eva took her role seriously and was a regular at the AGM and the annual dinner and prize presentation where she could always be relied on to say grace. I am sure that these is much more that could be said about Eva’s activities and interests over 94 very full years’, and apologies for any omissions or inaccuracies! I’ve certainly discovered a lot more about Eva in collecting information to include here, and I hope I have been able to give you a brief flavour of the lady and why she was such an endearing personality. It is very clear to me that Eva can be said to have achieved ‘a life well lived’, spanning sport, family and a whole raft of other interests, where she not just took part in, but made a wholehearted contribution to – and it was all done with her characteristic cheerfulness and encouragement. I am sure all of us here today have had our life enriched for having known and been around her.